Click the play button to hear interviews with Elm City residents affected by Monday morning's tornado touchdown. Tara Jones, right, hugs daughter Kayla in front of their Elm City home where the family of 12 survived falling trees all around their yard during a tornado Monday morning. Christopher Combs of Elm City looks at the mangled trunk of a cedar tree near his home at 106 S. Barnes St. in Elm City. The tree toppled when a tornado swept through the town Monday morning. Courtney Barnes hands clothing through a window to Nelson Johnston as the family gathered items from Bud Pittman's tornado-damaged home Monday morning in Elm City. Marie Harris of 403 Main St., center, stands in front of her home with her sons John Hall and Jahquon Mercer. A tree crashed into the house during a tornado Monday morning. Lt. Marcus Ruffin of the Wilson County Sheriff's Office ties a yellow bow of caution tape on a home to let other first responders know it had been checked and its residents accounted for in the aftermath of a tornado that blew through Elm City on Monday. Alan Parrish shared this picture of the tornado that tore through the Elm City area Monday morning. He says he took the photo from Sharon Acres Road just before first responders were dispatched to Elm City. ELM CITY — When Tara Jones heard the tornado warning, she gathered her husband and their 10 children downstairs in their Elm City home. Outside, the swirling storm knocked down trees on all four sides of their home and dozens of other houses in town Monday morning. After the tornado passed, Jones stood in her yard with her hand over her mouth, gasping. “Oh my God. It is our biggest tree in our yard. It uprooted and landed in our front yard, and we cannot even see our front yard from the window,” Jones said. She credits divine intervention with sparing her children, ages 3 to 14. According to Jason Cain, assistant chief with the Toisnot Rural Fire Department, between 30 and 50 houses in town had some degree of damage from falling trees and wind. Crews started clearing debris from the road and checked on residents in their houses. A National Guard unit, already in the area because of Hurricane Florence, pitched in. No injuries were reported, and the tornado didn’t leave any residents trapped inside their homes. “We did have a lady that we think got a little overheated, and we did have EMS come check her out,” Cain said. A tree fell on the railroad tracks, but CSX took care of that. Damage was contained to an area inside Elm City from Parker Street toward Nash Street and down toward Staton Lane, with many trees down on Anderson, Dixon, Barnes and Wilson streets and American Legion Lane. A large pine tree had a dead aim when it fell into the center of Bud Pittman’s house on Barnes Street. He, his wife and his grandson were in the house when the twister came through around 7 o’clock as Pittman was busy getting dressed. “My wife and I planted those pine trees 43 years ago when we got married. They were knee-high way back then,” Pittman said. The weight of a fully mature tree fell on the home Monday morning. Kelly Farmer saw the tornado as it headed into Elm City from the loading dock at Central Freight Lines about a mile outside of town. “We walked outside onto our dock, and we saw a large swirling cloud over the tree line going kind of down the train tracks from Wilson back into Elm City,” Farmer said. “I knew that it would probably cause some damage because it was a massive-size tornado. It went right down the railroad tracks right into down. Farmer estimates the storm’s path stretched a quarter-mile. Farmer watched the twister for about 30 seconds before it went out of sight. “It was loud when it came through here,” said Jerry Draper, whose brother, Danny Draper, had his pickup truck damaged by a falling tree on Main Street. “We’re just lucky that were didn’t have more down than we did,” Danny Draper said. Marie Harris’ husband, Lashawn Williams, warned the family to prepare for the storm just before a tree fell on their Main Street home. “He saw it coming and said to get down,” Harris recalled. The couple’s two 16-year-old sons, John Hall and Jayquon Mercer, took cover as a tree fell. “When I heard the booms, that’s when I woke up,” Hall said. Across Main Street, Chase Williams and his father, Harold Williams, own a rental home where several large trees in a row were knocked flat by the tornado’s winds. 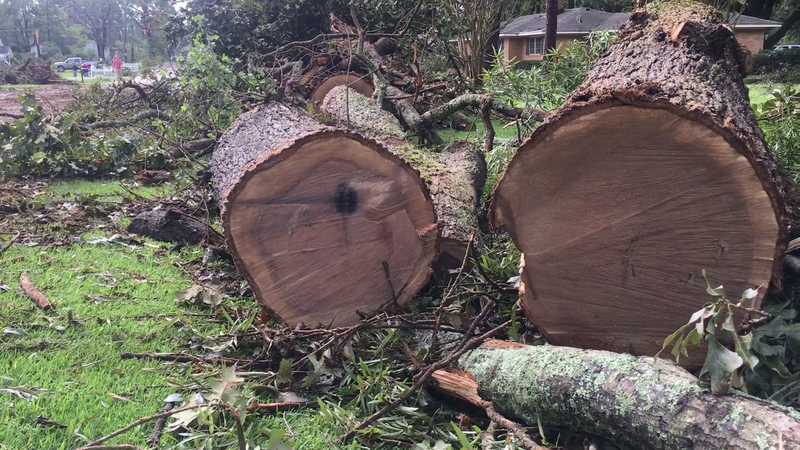 “We’re just lucky ’cause every one of these trees would have gone over the house, but they went into the empty lot,” said Chase Williams, a volunteer fireman. The tornado sheared part of the roof off Christie Combs’ Barnes Street home. “We’re all turned around now,” she said — somewhat distressed as she left the scene. Her son, Christopher Combs, was fascinated by the mangled and twisted trunk of an old cedar tree that was smashed into toothpicks. “It’s not what you want to wake up to in the morning,” said Christina Vellucci, a resident of Wilson Street. The tornado happened as the remnants of Florence, once a powerful hurricane, departed as a tropical depression. “We thought everything was behind us, and this comes through,” said Joseph Velluci. The National Guard assisted local authorities with crowd control around Elm City. Rodney Bass stood at the bottom of a ladder as Mark Adams stretched over to replace tin on a roof on Barnes Street for Blessin Vick. “We’re trying to keep the water out for her, so I thought I would get up there and plug this roof for her,” Bass said. Vick said the storm brought back memories of a historic hurricane more than 60 years ago.